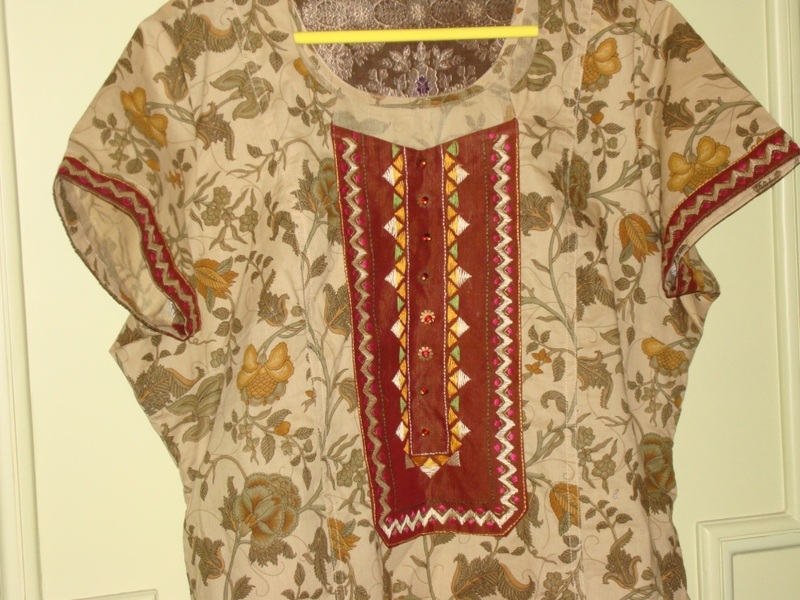 The pattern for this tunic was a simple diamond border . 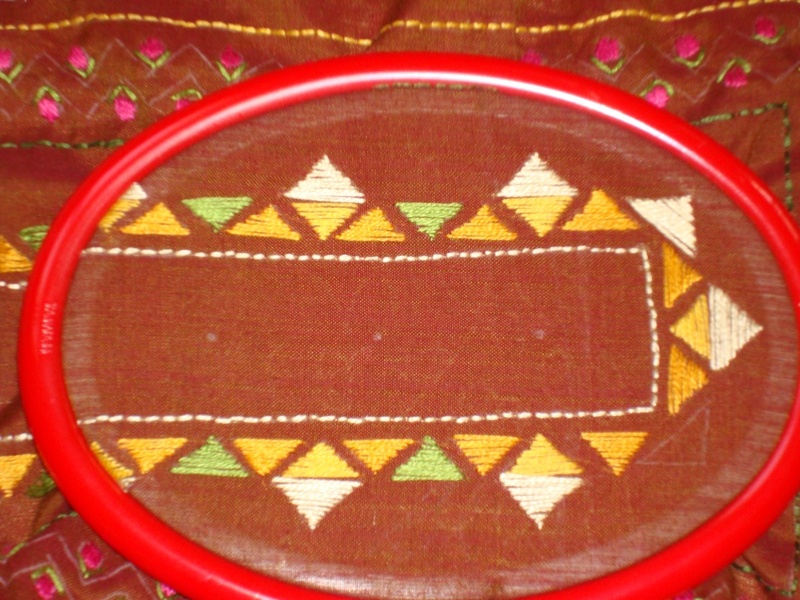 the main idea is to embellish this pattern with beads. 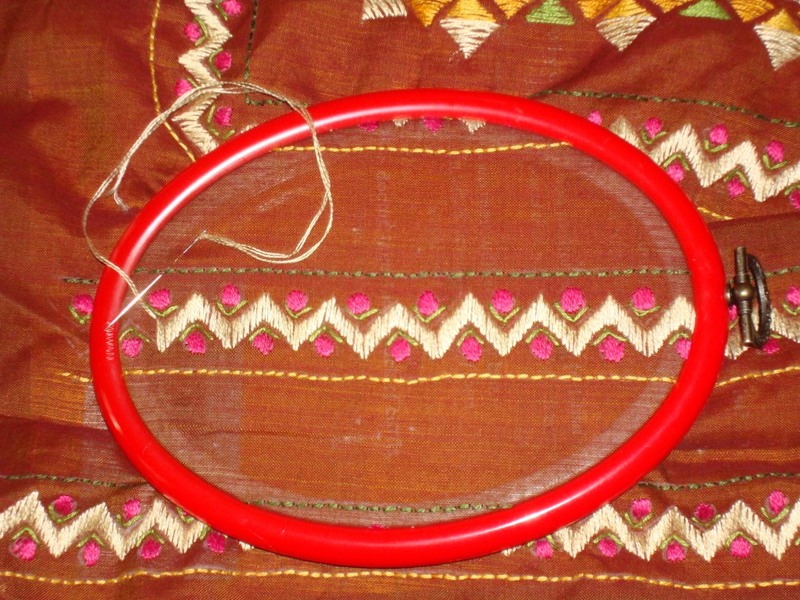 There were no scope for too many stitches or threads – just four straight lines and 1 curved design. I drew this pattern on a centimeter graph paper. If anyone used this pattern, I would be happy to see it. Enjoy! 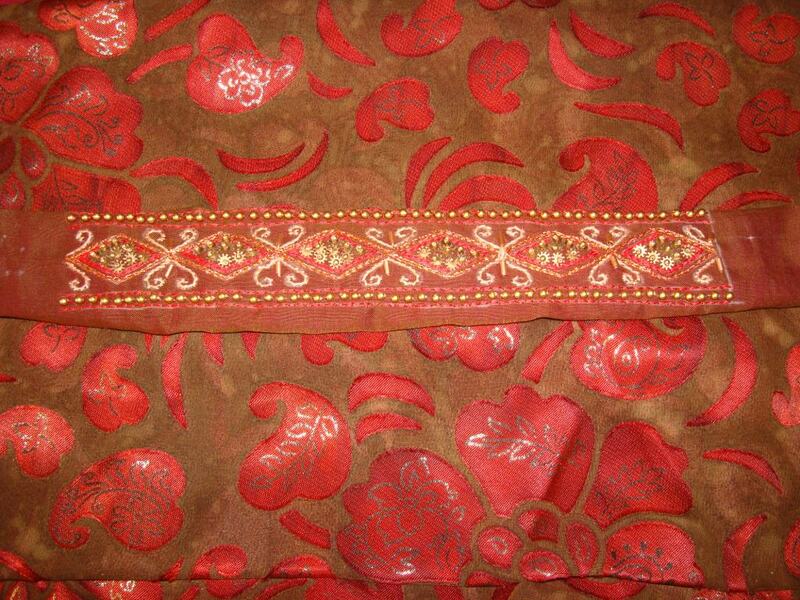 The embroidery , beadwork and sequins have been completed for the yoke on this brown fabric. This yoke was a simple one, did take much time to finish it. I wanted it like that. The fabric and colour of the tunic were so dominant, whatever work done on the yoke might have been over shadowed by the tunic. After completing the embroidery in red and gold thread, the sequins and antique golden beads are stitched to the border pattern. The centre diamond is filled with sequins and beads. The bugle beads are stitched into the gap between the heart shaped curves. Round golden beads are threaded along the borders. Yoke sewn on to the tunic on my next post. This tunic fabric is different from my usual cotton addiction. A family friend suggested this out let , where they sell synthetic fabrics. I too wanted to try my designing on these fabrics. 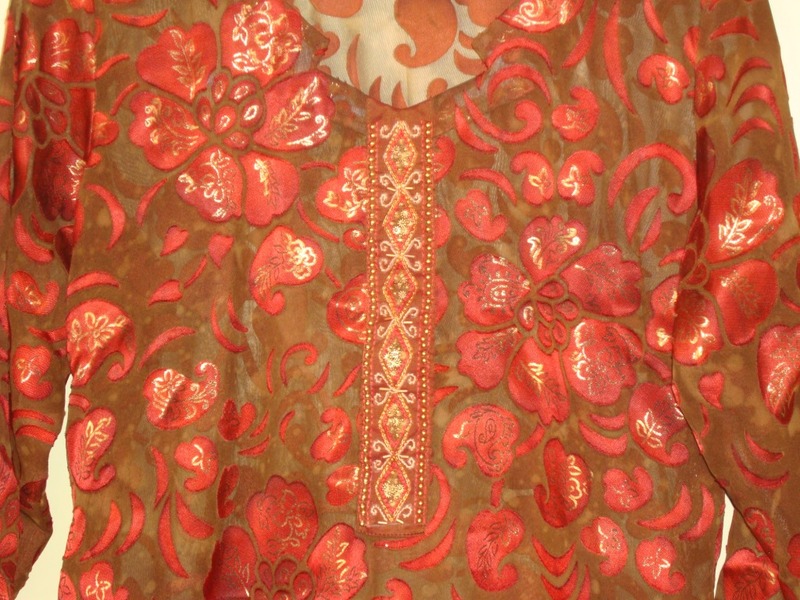 This tunic is brown[ they call it brasso work!] with red and gold print. I wanted a simple yoke, so the base fabric chosen was brown. The pattern is a geometrical repeat pattern,the idea was to work the embroidery and add some gold sequins and beads. 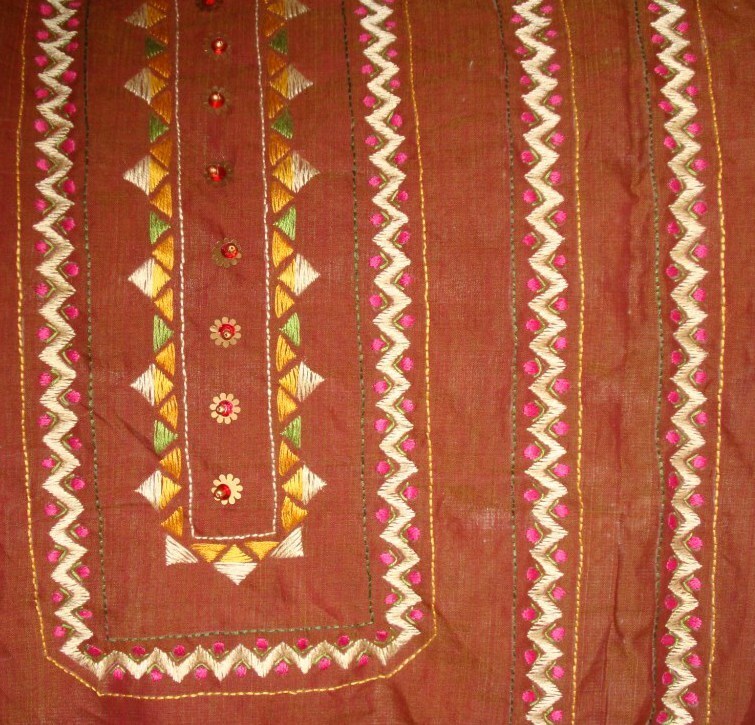 The embroidery was done in red and gold colour thread. Will continue with the yoke on my next post.